The CD-S2100 provides a new circuit design for elimination of audio loss, plus a high precision drive mechanism for reproduction accuracy. This high-grade CD player delivers the new sound of Yamaha and is equipped with high-performance USB audio and DAC and other advanced functions. The CD-S2100 has completely symmetrical construction: the rotating loader mechanism is in the center, the digital power supply and circuit board are on the left side and the analog power supply and circuit board are on the right. Completely isolating the digital unit and the analog unit eliminates detrimental impacts of interference between the circuits while achieving ideal weight balance. The center frame that extends from the front to the back of the body, along with a front panel made of 1/4” thick aluminum, increases rigidity of the entire chassis and ensures stable disc play. The internal design of the CD-S2100 does not separate the power supply circuit boards, which include the power transformer; the block capacitors are mounted directly on the respective digital/analog circuit boards. Thus, an original board configuration which integrates the power supply circuits was adopted. Eliminating cabling from the power supply circuits to each circuit board and mounting directly have the benefit of reducing connection loss as well as achieving low impedance. Moreover, cabling from the power transformer utilizes the same screw-type connections we’ve given the companion A-S2100 integrated amplifier. Connecting directly without soldering achieves thorough contact point loss and low impedance. Signal is transmitted to the amp without loss of any information that has been read, delivering sound reproduction filled with a sense of energy and crisp openness — the over-arching aim of the S2100 Series. The CD-S2100 has adopted a twin power supply transformer method complete with separate, dedicated power supply transformers for the digital and analog circuits. Isolating the digital and analog circuits starting at the transformer step eliminates sound quality deterioration caused by interference and noise between the digital and analog units — a problem that occurs when they share the same power supply. This results in exceptionally clear, low-noise reproduction of analog audio. Moreover, the power supply transformer for the analog circuit is a toroidal transformer that provides stable power supply with low magnetic flux leakage. The stabilized power supply circuit is completely isolated on the left and right sides. This achieves superior separation – a particularly important point in Hi-Fi audio. The CD-S2100 is equipped with the same drive mechanism as the Yamaha flagship model CD-S3000 in order to perform high precision reading of the vast quantity of audio data recorded on a disc. The loader mechanism is connected firmly to the chassis by installing heavy, specially curved 1/16” thick iron reinforcing anchors in front of and behind the loader mechanism, eliminating the transmission of vibration caused by disc rotation to the circuit board. In the process of assembling the CD-S2100, after the drive mechanism has been attached to the chassis, horizontal fine adjustment of each anchor is performed carefully. While this is difficult, it shows Yamaha’s commitment to providing the ultimate in precise signal reading. By eliminating even the slightest tilting of the mechanism, this achieves stabilized rotation and ultra-precise reading. Reducing the load of the servo that drives the pickup and lowering the impact of change of servo amperage on the signal achieves clean signal readout with little impact of noise — drawing out every little nuance the artist has recorded. The CD tray is made of high rigidity aluminum, reducing secondary vibrations due to resonance of the disc and the high-speed motor rotating the disc, resulting in improved audio signal reading precision and quieter operation. In addition to the smart design and luxurious texture, we’ve fine-tuned the opening/closing action by adding a specially designed meshed wire drive, achieving smoother and gentler operation. We obsessively strove to give the unit a luxurious operating feel that perfectly matches the superior sound quality. The D/A converter for the CD-S2100 is the ES9016 from ESS Technology, Inc. We selected this after careful examination of all points — not only its high precision processing of 32-bit audio, but also the ability to handle large amounts of audio data, strength in the low register and high-quality definition in the high register. Since the built-in D/A converter generates its own master clock, an original jitter elimination function is also included, permitting D/A conversion with extremely low impact of clock jitter. Moreover, an 8-channel D/A converter is housed inside the chip and applies double differential operation using 4-channel D/A converters on the right and left sides, respectively. It delivers exceptional high performance and high-quality signal output with superior signal-to-noise ratio, since it employs an analog signal processing circuit with balanced configuration. For optimum enjoyment of today’s high-resolution audio sources, we designed the CD-S2100 with superior D/A conversion and balanced signal output and equipping it with a built-in USB DAC function that allows direct input of digital audio (from a computer, etc.). The USB DAC employs an original IC, developed specifically for Yamaha. It has an internal master clock and can perform low-jitter transmission. The CD-S2100 supports the ASIO 2.3 protocol to take full advantage of the sound quality of the USB DAC function. The ASIO 2.3 protocol is a standard protocol for professional use digital audio or DTM, with a significant sound quality benefit: the ability to achieve lower delay and higher throughput than with a standard OS sound driver. The driver software is the ASIO 2.3 Yamaha Steinberg USB Driver* and allows high quality playback of digital audio data stored on a computer. 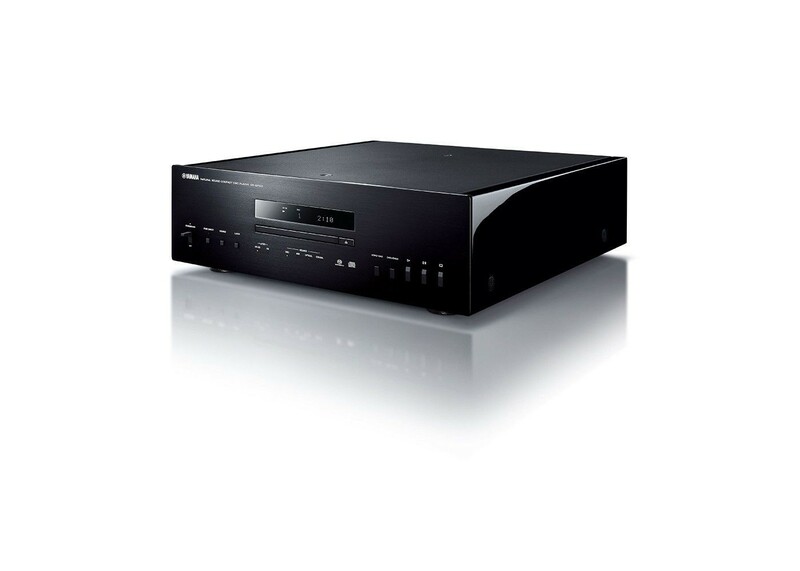 The unit is compatible with digital audio of up to 192 kHz/24-bit resolution and supports DSD native playback. The insulators are crucial parts that block outside vibrations. They adopt Yamaha’s original metal legs in order to maximize vibration control performance. The user can select point installation by applying the supplied spikes or plane insulation with the supplied pads and use these combined with an interlocking rack if desired. Inside and out, the CD-S2100 fully demonstrates Yamaha’s commitment to fine craftsmanship and its long history as a premier maker of musical instruments. In the connections between the front panel and the side wood, masterful use of advanced processing technology beautifully integrates different materials, metal and wood. On the CD tray, the gap between the front panel and the tray is uniformly precise. The display unit is of half-mirror design, with track information beautifully displayed during CD playback. When the power supply is off, it harmonizes beautifully with the aluminum hairline finish of the front panel.